Although the word is occasionally overused, it’s no exaggeration to say that there’s a renaissance of sorts developing within the athletic apparel industry. In particular, wool performance clothing is more prominent now than it has ever been, and appears to be gaining momentum with every passing month. The fabric has been utilized for hundreds of years, but it’s only been over the past decade or so that athletes have turned to wool for high-level performance needs. Part of this has to do with modern processing methods… but the ultrarunner in us likes to think that it’s also related to channeling our animal nature. Most performance wool on the market is merino wool, harvested from Merino sheep, which is widely recognized as one of the toughest and most resilient animals in nature. Merino sheep originated in Spain and thrive in the Southern Alps of New Zealand, a mountain habitat known for searing heat in the summer and ferociously inclement winters. A Merino’s fleece is built to withstand extreme conditions: it breathes and cools during 100-degree temperatures in the summer and protects and insulates during wet sub-zero winters—while effectively managing all conditions in between. Merino sheep thrive in conditions that would make normal sheep whimper and cry—in other words, they have a lot in common with ultrarunners. So what exactly about merino wool makes it an ideal performance fabric? A number of physical and chemical aspects of merino wool combine to make it the world’s best naturally odor-resistant fabric. First, there’s virtually no microbial attraction to the fiber. While bacteria are typically attracted to the smooth, positively charged surfaces of synthetic fibers, they are not drawn to the scaly and neutrally charged surface of merino fibers. Next, merino has a much greater capacity than other fibers to absorb moisture (more on this shortly), and when this moisture is bound within the structure, microbes are unable to penetrate to the surface of the fiber. This moisture is efficiently transported away from the skin, so your sweat doesn’t remain on your body surface long enough for bacteria to develop and create odors. If you hate the stench of synthetic fabrics, merino apparel is for you. As part of our testing, we wore shirts for five to seven straight days of running without laundering, as well as keeping shirts on for a full day after a long morning run without showering. By all means a risky experiment, but the merino wool didn’t stink. Period. That should be enough reason to give it a try. The core of a merino wool fiber is naturally hydrophilic, so it moves moisture away from the surface of your skin and towards the drier external environment for evaporation. Functionally, it’s an extension of your body’s own natural cooling system. Because the ends of the fibers tend to absorb moisture, merino shirts are slower than synthetic fabrics to dry completely during and after use. However, the fibers create a balance in moisture conditions that makes the fabric comfortable in a wider variety of climates. Merino wool can absorb up to a third of its weight in moisture without feeling damp or clammy. This allows it to keep the surface of your skin dry in warm conditions, but more importantly, it keeps a layer of dry air next to the skin during wet or cold conditions, which retains your body heat. What’s more, when wool absorbs moisture, the hydrogen bond of water is broken and chemically reacts with molecules of the wool to generate heat. All of this makes wool an ideal temperature regulator in wet conditions; it can be completely soaked and still keep your body warm. For ultrarunners, this translates to outstanding protection against hypothermia during a wet 50-miler or the cold night of a mountain 100-miler. Yes, comfort. If you’re shocked to hear this, you probably have visions of your father’s Army blanket or your Grandma’s itchy old sweaters in mind. Rest assured, merino isn’t your daddy’s wool. Today’s fabrics are as plush and silky-smooth as any other you can find—and this is where the manufacturing process has advanced the most in recent years. And because it continually assists in regulating your body temperature, your comfort in merino wool is more than skin-deep. Those seven-straight-day running tests didn’t only demonstrate merino’s odor resistance; they also showed us how durable the fabric is. On a microscopic level, wool fiber takes the shape of a coil spring, which makes it naturally elastic. The fiber can be stretched up to 50% when wet and 30% when dry, and can be bent or folded back on itself many thousands of times without thinning or breaking. We’ve owned a few merino shirts that have been worn week-in and week-out for several years without signs of wearing out. Keep this fact in mind when you see the prices of merino garments, because as a general rule, they don’t come cheap. However, each garment is an investment that will almost certainly pay off in a lifespan that far exceeds synthetic clothing. Wool harvesting and production is one of the most environmentally responsible processes in the entire apparel industry. Its source is completely natural and 100% sustainable. Since you can wear it over and over without washing, your household conserves water and energy from doing less laundry. And when you’re finally done with the product—however many years that takes you—the fabric is fully recyclable or biodegradable. Sheep farmers and wool apparel companies are frequently recognized by awareness groups and environmental watchdogs as the most ethically and socially responsible businesses out there. Heard enough yet? How about if we add that merino wool is naturally UV-resistant, abrasion-resistant and even flame-resistant? All of these are true, and further evidence of why a merino garment should be at the top of your shopping list. As to that renaissance we mentioned: if we had done this review a couple of years ago, there might have been three or four companies with products to test. Today we’re discussing 10 different companies, most of whom are based in the United States, and all of which are creating outstanding products and doing business the right way. This is an industry you should want to support, and these are companies you should love to support. We’ll tell you a bit about each company here, as well as the products they provided for testing. Truth be told, this was a somewhat challenging review to conduct, mainly because there’s very little to differentiate one product from another in terms of quality and performance. We’ll point out a few pieces that captured our hearts, but it’s hard to make a bad decision among the products that follow. Selection comes down to your preferences of style and intended use. Merino wool is a true year-round fabric, equally effective in winter running kits or lightweight summer styles; accordingly, one key spec to look at is the garment weight, which we’ve included for each piece in our review. And with that… let’s get to the gear! Icebreaker was the pioneer of the modern merino movement, starting back in 1994 after founder, New Zealander Jeremy Moon, got his hands on a lush fabric that was shown to him by a local sheep farmer. Moon saw its potential for use as a performance fabric, and initially had to almost athletes raised on synthetic materials, who were skeptical about the benefits of natural fabrics. Moon’s persistence ultimately paid off, as Icebreaker has become the industry f lag-bearer in many capacities, and offers an extensive line of merino wool apparel for both active and casual use. Our testing included the SS Aero Crew (140g*, $60), an ultralight tee comprised of Icebreaker’s Featherweight 120 fabric that’s perfect for hot summer days. Material construction is 90% merino wool with 10% elastane for improved freedom of movement. Featherweight 120 is Icebreaker’s thinnest material, and the Aero is the second-lightest model in our testing. For standalone pieces or cold-weather base layers, Icebreaker’s Sonic LS Crew (160g, $100) uses a slightly thicker Ultralight 150 fabric in a 96% merino/4% Lycra blend, and the Sprint LS Crew (190g, $100) is made of a thicker Lightweight 200 shirts utilize flatlock seams to prevent chafing, and both of the long sleeve crews feature extended cuffs with thumb holes to provide extra insulation at the wrist and hand. Smartwool is another relatively old-school wool company that’s been around since the 1990s. Their home base is in the Rocky Mountains of Colorado, so they have an appreciation for apparel that is suitable for temperature extremes. They have the most extensive collection of wool products for runners, and can cover you from head to toe, with everything from socks to underwear to leggings, tops, jackets, gloves and hats. All of their apparel incorporates Merino wool, and it is utilized predominantly in base layers like the 85% Merino/15% nylon PhD Run Long Sleeve Crew (160g, $95) or the PhD Run Short Sleeve Crew (144oz, $85). In their outerwear, they blend Merino with synthetic fabrics for specific performance benefits; for example, the PhD Run Vest (275g, $160) has a polyester outer shell to provide wind resistance, and the PhD Run Tech Tights (245g, $125) use only 24% Merino wool combined with nylon and Elastene to provide shape and flexibility. Later this year, Smartwool will release a new Merino/Polyester blended fabric called Ultra Light that is designed to increase Merino’s moisture management capabilities under high exertion—look for it in the company’s summer apparel offerings. Ibex Outdoor Clothing has sustainable business at its core; the company headquarters in White River Junction, VT, is a re-purposed car dealership. They also actively solicit wool garments at the end of their lifespan to have them properly re-purposed. Their extensive catalog includes an almost even breakdown between athletic and casual apparel, and they specialize in athletic apparel that can easily double for casual use. The Shak Jersey (503g, $155) is a perfect example: a 100% New Zealand Merino wool half-zip mock turtleneck with dense knitting that can be used as a standalone top or a heavy base layer—and it’s good looking enough that you can wear it out to dinner after your evening run. The Shak has a slightly coarse feel compared to other Ibex tops, but is still comfortable against bare skin for all-day use. For plush softness, try their Seventeen.5 Tee (204g, $75), another 100% Merino product that proved to be the silkiest shirt in our testing. It fits like a normal T-shirt, and in terms of pure comfort, it’s pretty much unbeatable. Anybody familiar with the Patagonia company knows about its standing in the sustainable business community. The Southern California company, founded to tackle big walls and big waves, is on the forefront of multiple environmental initiatives such as 1% for the Planet, and their Merino wool comes from a partnership with The Nature Conservancy to protect grasslands in Southern Argentina for Merino sheep and farmers. Patagonia offers Merino tops in three different thicknesses. Merino One combines 65% Merino with 35% of the company’s patented Capilene recycled polyester that enhances wicking; it is used in their Merino One Silkweight Short Sleeve Crew (133g, $65) which is the lightest shirt in our entire review, or the Merino One Long Sleeve Crew (164g, $70). Merino Two is an 80% Merino/20% Capilene blend offered in the Merino Two Midweight LS Crew (198g, $90), and the same 80/20 blend is used for the thicker Merino Three Midweight LS Crew (266g, $115) or Merino Three Midweight Hoody (351g, $140). One interesting new company in our testing isn’t technically new—they’re more like 140 years old. I/O Merino is owned and operated by the Michell family, sixth-generation Aussie wool farmers who have been involved with every aspect of the wool industry throughout the years, from harvesting to cleaning to processing to knitting. They have historically sourced their materials to other companies for their production needs, but now I/O takes first dibs at the wool they want before farming out the rest. They use this prime inventory to create their own unique fabric called MicroMerino. They also use their comprehensive industry experience to oversee every step of the production process in-house for quality control. 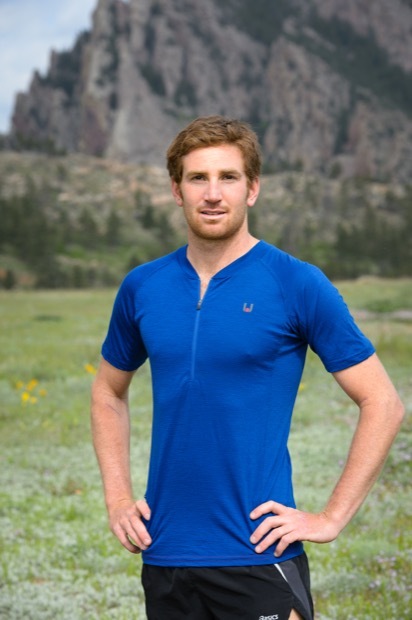 I/O’s Altitude Short Sleeve (150g, $69.50) and Altitude Long Sleeve Zip (240g, $94.50) are both made from 96% Merino and 4% elastin, with flatlock stitching, raglan sleeves and tagless construction to decrease chafing. The short sleeve version is form-fitting and very thin, while the long sleeve has a regular fit, zippered mock turtleneck and extended sleeves with thumb holes. We first had the opportunity to try PULSE Activewear about a year ago, when they provided their 100% Merino Short Sleeve Zip Trail Runner (160g, $80) to a couple of our staffers to use in 100k and 100-mile events—in both cases, they performed wonderfully, even in hot conditions for one race and inclement weather for the other. The Zip Trail Runner is the only zippered short sleeve shirt in our review group, and one of our testers declared it the best ultrarunning top that he has ever used. In long ultras (100k and over) you can face multiple weather scenarios over the day and night, and precipitation can come and go—this top handles all of it well. Denver-based PULSE performs extensive field testing with athletes throughout the design process and does all of its manufacturing in the USA using wool sourced from New Zealand. Their product line focuses on essential pieces with high quality across the board. In addition to the Short Sleeve Zip, they have a standard crew-neck Endurance Tee (150g, $65) that is slightly thinner and a bit more form-fitting than the zip version. You can purchase PULSE items on their website and at a growing number of specialty running stores. from a startup company. Their business model is a bit unconventional, as they don’t do any retail sales, preferring to sell exclusively from their website. This helps them offer their products at a lower cost, and PEP probably offers the best combination of quality and value in our testing. We wore the mid-weight Stayton Short Sleeve (235g, $69) as a single layer during a drizzly and cold 50-miler in December, and it stayed comfortable the entire day. The Stayton is 97% Merino and 3% Elastene, and features an innovative back design with V-shaped venting along the latissimus area to improve breathability. The Shevlin Long Sleeve (215g, $60) is a thin 100% Merino base layer with thumb holes that works great underneath a light jacket, and the Bristow Short Sleeve (140g, $69) is an 86% Merino/8% modal/6% Elastene piece that was our female tester’s favorite from this review for its combination of fit, style and performance. Echoing the mountain culture of some others in this group, the Stio company is based in Jackson Hole, WY, and seeks to promote connections with the outdoors through stylish and functional products. They also have a network of partnerships with organizations in a shared mission of advancing the outdoor industry and protecting our wild surroundings. The majority of Stio’s product line is casual wear, but they have a small collection of active base layers and outerwear. We tested the Basis Stretch Merino LS Crew (255g, $115), a 95% Merino/5% spandex that has a regular fit with tag-free, chafe-free construction and works great as a base layer. For colder outings, Stio has a thicker and warmer Basis 21 Merino Hoodie (482g, $165) made of 100% Merino with a relaxed hood and zippered hand pockets—this comes in second place to the Ibex Shak jersey for high-performance apparel you could also wear on a date without looking like a dirtbag. WoolX is a company based in upstate New York whose entire product line is composed of 100% Australian Merino wool. They’ve focused their efforts on creating premium base layers for active pursuits like running and cross-country skiing. They make men’s and women’s tops and bottoms in three different weights to accommodate year-round adventures. As part of their manufacture process, they “relax” the fabric, meaning it’s unrolled and spread for a period of time before being cut and sewn, which results in a more consistent fit and eliminates any shrinkage. They also use flat seam and tagless construction to prevent chafing. Their X-Plorer Midweight Crewneck (295g, $90) is a great long sleeve shirt that can be used as a standalone or for layering, and their Lightweight T-shirt (172g, $68) is a comfortable warm-weather option. Both of these tops have a regular fit and long torso length, which makes them easy to tuck into bottom layers. The last company we’re including is probably the most well-established of this entire group: Good ole L.L. Bean. Founded in 1912 and based in Freeport, ME, L.L. Bean is legendary for its customer service, if less so for its trail running apparel. However, their Cresta Wool Midweight 250 Base Layer Long Sleeve Crew (325g, $64) is a 100% Merino shirt that has flatlock seams and thumb hole sleeves, and has all the performance functions of the other shirts in this review. The feel of the Cresta is slightly coarser than others in our testing, but it’s a very subtle difference, and didn’t prove uncomfortable at all through any of our durability testing. It also happens to be the lowest priced shirt of the whole bunch… and on the off chance you don’t like it, you can always return it with no questions asked. In addition to outstanding base layers, some of the companies mentioned above make winter accessories such as hats and gloves. As a general rule, wool hats are less wind-resistant and provide less insulation than most synthetic fleeces or wind-blocking polyester, so they’re less effective as a single layer than some of the hats we covered in our winter running apparel review. However, they are typically very thin and therefore can be easily worn underneath a hood, and because they are so breathable, it’s easier to leave them on your head when the day warms up without feeling like you’re overheating. The Smartwool NTS Mid 250 Cuffed Beanie (35g, $28) has a rolled cuff to double the fabric over the ears, while the WoolX Heavyweight Cap (45g, $35) provides the best coverage and overall insulation from the group we tested. Ibex has an interesting pair of beanies: the Meru Hat (40g, $30) is thicker and generally warmer, but the Zephyr Earflap Beanie (31g, $40) is longer and does a better job of staying over your ears. Of the hats mentioned above, all are 100% Merino wool except the Ibex Meru, which is 89% Merino combined with Lycra and nylon. Icebreaker also uses 16% Lycra in its Sierra Beanie (35g, $30). Finally, it’s worth mentioning that a number of the companies above also make Merino underwear for both men and ladies. This wasn’t a category we tested extensively for this review because of limited sample sizes—but of the ones we tried, the Stio Basis Power Dry Boxer (99g, $55) was the best for keeping everything nice and toasty, while the WoolX X-Lite Lightweight Boxer Brief (75g, $45) was the best for keeping everything in place. The WoolX boxers also have some racy stripe patterns that might make you feel like a tiger on the inside, if that’s your thing. Maybe we’re scratching the surface of a larger need here: perhaps there will be an all-underwear review in the future? That’s when gear reviewing gets really personal. In the meantime, make a personal choice among the excellent products described above, and come join the Merino wool renaissance. Subscribing to this e-mail is costing me money – I just ordered a couple of pair of warm weather-weight Smartwool socks. Ha! have a couple of pair of smart wool socks. Absolutely the best things I have ever run in. However when the washing machine monster eats one, I want to throw up. ($$$ down the drain literally) Changing washing machine habits. Purchased a Pulse short sleeve zip trail runner shirt last year at Pikes expo. It was hands down my favourite running shirt…..keeps you warm in cooler weather, wicks moisture away and washes up well. I wear it running and biking…..great product. This year I was so happy to find the “Pulse guys” again……I bought 2 more shirts. Canadian girl with a Colorado heart!! Thanks for the reviews. After reading about the Icebreaker Aero, there is product information but not really a review.